When you go through camera menu options, you might come across a number of different options that are related to the way your RAW images are saved. One of those options is typically the type of compression that is applied to RAW files. There are several reasons why camera manufacturers provide RAW file compression options, but the most basic one is to save space. Let’s take a look at file compression options and explore differences between compressed, uncompressed and lossless compressed RAW files in more detail. To Save Space – this is the main reason, as the primary benefit of any type of compression is, first and foremost, space savings. Since compression allows RAW images to be smaller in size, more images can fit into the same memory card. Keep in mind that reduction in space affects the whole photography workflow, because you will end up with smaller files on your computer and your photo storage, which in turn, also makes your backup workflow more efficient. To Write and Transfer Files Faster – when RAW images are physically smaller due to compression, your camera can write them faster to memory cards. In addition, the amount of time it takes to transfer those same images to your computer or your storage is also cut, sometimes significantly. To Increase Continuous Shooting Time – when files are smaller, they also take up less space in your camera’s buffer, which can potentially increase the length of time you can shoot continuously. However, this is not always the case. For example, on older cameras with slower processors, applying RAW compression actually slowed down the camera’s continuous shooting speed, because RAW compression is a processor-intensive task. To Reduce Resolution – some cameras have options to reduce the actual resolution of RAW images either through sensor cropping, or through image resizing / down-sampling (which is known as “Small RAW” or simple “sRAW”). While the former is not related to RAW compression, the latter is done with RAW compression in mind. In fact, as detailed in our sRAW Format Explained article, such compression levels can be rather extreme, resulting in significant losses of valuable data. Unless you don’t mind losing some of the data in your images, it is often best to avoid lossy compression. Lossless Compressed – as the name implies, lossless compression means that a RAW file is compressed like an archive file without any loss of data. Once a losslessly compressed image is processed by post-processing software, the data is first decompressed, similar to what happens to archived data contained in a ZIP file. Lossless compression is the ideal choice, because all the data is fully preserved and yet the image takes up much less space. Uncompressed – an uncompressed RAW file contains all the data, but without any sort of compression algorithm applied to it. Unless you do not have the Lossless Compressed option, you should always avoid selecting the Uncompressed option, as it results in huge image sizes. On every camera I shoot with, I always default to Lossless Compression, because it is the most efficient way to store RAW images. There is no benefit of shooting Uncompressed RAW and Lossy Compression results in loss of potentially valuable data, which I might need to recover shadow / highlight details in images. Along with different compression levels, RAW images have the potential to store varying levels of tones per channel, per pixel, which is known as “bit depth”. By default, most cameras shoot in 12-bit RAW, which translates to 4,096 tones per channel (red, green and blue) per pixel. If you do the math (4096 x 4096 x 4096), this equals roughly 68.72 billion tones per pixel. When bit-depth is increased to 14-bit, the number of tones per channel quadruples to 16,384, totaling 4.39 trillion colors per pixel. And although most digital cameras today don’t even have an option for 16-bit RAW files, if it became available, you would be pushing over 281 trillion tones per pixel. That’s a heck of a lot of data to work with – you can only imagine how big those RAW images would get without any compression! As you can see, there can be a pretty dramatic difference in file sizes when choosing between 12-bit and 14-bit, as well as different compression levels. And these differences add up quickly when you take tens of thousands of images into consideration. With a 60.9% decrease in file size when shooting 12-bit compressed RAW, one might think that it is a good option to pick. However, it all depends on your shooting technique, what you shoot and how much information you typically recover from highlights and shadows when post-processing images. For example, if I consistently exposed well when shooting portraits and my post-processing was very minimal, I would probably be just fine shooting 12-bit compressed RAW. However, if I wanted to maximize my highlight and shadow recovery options when doing landscapes or astrophotography, I would feel safer shooting 14-bit lossless compressed, since it would let me take a full advantage of my camera sensor and still produce files that are practically half in size. That extra 15% of file size reduction isn’t worth it in this case, especially if it limits any of my recovery options in post-processing. Keep this in mind when considering bit depth and different RAW compression levels! Also, it is important to point out that some cameras don’t even give you the option to choose between different bit-depths and compression levels, typically defaulting to either 12-bit lossy compressed RAW (on most beginner-level cameras) or 14-bit losslessly compressed RAW (on more advanced camera models). Let’s now go over some of the options when going through different camera brands. Unfortunately, Canon does not provide options in its camera menu to pick between different bit depths or RAW file compression levels, so you will need to refer to the camera manual to find out what bit depth and compression level your camera shoots in. Most of Canon’s entry-level cameras shoot in 12-bit lossless compressed RAW, whereas most of the higher-end models will shoot in 14-bit lossless compressed RAW. Unfortunately, all current Sony digital cameras are limited to lossy 11 + 7 bit delta compression by default. After many customer complaints, Sony added an option for Uncompressed RAW on some of its cameras such as the Sony A7R II, but that obviously results in huge RAW files, as explained above. To date, Sony has not added an option for Lossless Compressed RAW images on any of its cameras. It can be shown that classic Huffman compression is lossless, but it is expensive in processor overhead and for near-random data (like in a busy high-DR photo) it may not result in a smaller file, or the result might even be larger. I wonder if the cameras that offer lossless raw compression know to avoid compression if the result would not be smaller. Or does this happen so rarely that the occasional larger file is accepted? This prompted me to look at the current batch of lossless compression algorithms. They make the Huffman algorithm seem simplistic now, and while I think it possible that a losslessly compressed image may be larger than the original it seems very unlikely. Shane, from what I know, compression always results in smaller files, because there is always plenty of duplicate data in RAW files. I have photographed very complex scenes with lots of variation of pixel-level data and even then the compression ratios remained very high. To date, I have never seen a case where a compressed RAW image was even close to the uncompressed one. 1. RAW image data is not “nearly random”. 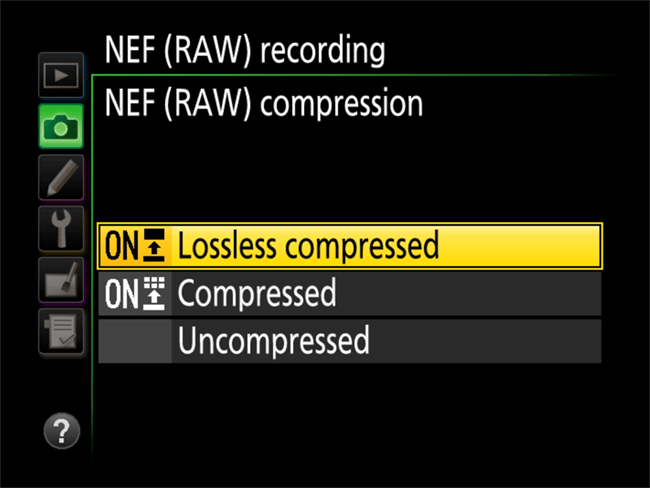 Uncompressed NEF is almost double in size than lossless no matter what you shoot. 2. The compression is actually very fast to implement and the processing cost is minimal. In fact it is more than offset by having to move less data through the pipeline and especially to/from sd card. With pleasure, I’ve read one more excellent article Nasim. I’m one of your more silent readers, so comments from my side are limited, mainly because of the thoroughness of your writings. I started my digital journey way back, with the guiding of Michael Reichmann and his early days of Luminous Landscape. Me coming from film, Micheal opened this tech world for me, for which I’ll always be grateful. Photography Life is today the place I go, when in doubt. You make it all clear in such an elegant manner. With much respect, my compliments. Thank you for your kind words Hans. Michael Reichmann was my icon for a long time… I was always a big fan of his work and his teachings. It was very sad when I found out that he passed away – his last video with Kevin sitting and laughing over a camera that Kevin could not pronounce was very funny. Glad that you’ve enjoyed the article, we will have more great content coming soon! Trying to get ready for the solar eclipse trip – I am leaving tomorrow to Wyoming and I will be gone for the next 10 days! I wasn’t aware of these options until reading this. Just checked my camera manual and there it is. Thank you very much. It just goes to show that having a 500 page manual isn’t the answer. Glad you found something new in the article Peter, thanks for dropping by! And yes, very few people will actually need 45 MP images. Landscape, macro, wildlife and architecture photographers will obviously rejoice, but portrait photographers will hate the post-processing and storage concerns that will come with it. For that reason, if Nikon indeed manages true pixel binning, the D850 will replace every DSLR Nikon makes, period. So did you sell all your Nikon DSLRs to buy a D850? I’ve found that it doesn’t feel like it takes much longer, if longer at all, to process D850 RAW files vs those from a D810. I would like to add the information, that most cameras have true 14 bit capabilities (if at all) only under their lowest iso and the usable data fall very fast below the 12bit. E.g. the Nikon D810 has for (only) ISO 800 well below 12Bit of usefull data, so you would lose nothing when switching to the 12Bit format. Manuel, that’s a good point. 14-bit is very valuable at base ISO, but the further you get away from it, the less latitude there is in images. This is especially true for dynamic range. I’m not sure this true. There is reduction o DR, but It depends on how the ADC system works when producing the RAW file. In the opposite direction, as JPegs only use 8 bits, one cpuld argue that in practice 14 EV is a waste, but it is not. I believe Renato is correct. At least some camera models seem to behave differently in 12- and 14-bit modes. I always assumed that the sensor data is always read out in the same manner, at a 14-bit resolution, and is simply downconverted to 12 bits in software if that type of RAW file was selected. But I found evidence that at least in the Nikon D7100, the bit depth setting affects more than how the data is stored. I can see considerably more shadow banding in 12-bit mode than in 14-bit mode. That can’t be explained by bit depth alone. In 14-bit mode, the D7100 uses digital amplification above ISO 3200. We can see this by looking at the raw values in the NEF file: at ISO 6400 only even values are used and at ISO 25600 only multiples of 8. If 12-bit files are produced by simply discarding the last two bits from 14-bit data then we should see only even values in a 12-bit ISO 25600 raw file, but this is not the case: both even and odd values are there. Conclusion: the camera must be digitizing the sensor readings differently in 12- and 14-bit modes. Nikon uses ‘cooked raw’ in the production of its NEF files: some manufactures do likewise; some do not. Therefore, it should not be a surprise when we discover that cameras use one algorithm for producing their 12-bit raw files, and a different algorithm for producing their 14-bit raw files. Such cameras do not produce their 12-bit raw data by “simply discarding the last two bits from 14-bit data”. I would suggest that any camera — whether or not it outputs ‘cooked raw’ — which uses an algorithm that simply discards the two least significant bits of its 14-bit data, in order to produce its 12-bit data, has been designed and marketed by persons who are ignorant of the fundamental principles of digital signal processing. I’m currently unaware of manufactures who demonstrate this level of ignorance: do you have any verifiable examples of it? Any kind of compression is taking to consume some of the processing power of the camera. Thus, are there any tests which we normal users can run – with defined set of parameters – that can help in obtaining performance degradation statistics? I am guessing this would have an impact for sports and wildlife photography. May be I am thinking too much into this. If write speed, not processor speed, it the bottleneck because of SD card limits or camera data bus limits, compression benefits sports and wildlife photography. This is the case for most digital cameras. For example, several new cameras will eventually fill their buffers when shooting RAW even with the fastest available SD cards (camera data bus limitation), but never fill the buffers when shooting JPEG. Satish, this was a concern on earlier camera models where the processors were not very powerful. But with the modern DLSRs, Nikon and others manage the process of file compression very efficiently, processing and writing them even quicker than uncompressed RAW files. So there is no FPS penalty when shooting compressed, lossless compressed vs uncompressed RAW. I see one potential advantage to not compressing (at least on system with a fast SSD). That would be the time it takes post-processing software to load and manipulate the image. Granted these days that time is minimal (but who knows what they’re doing in epically slow Lightroom ;) ). Pavlos, I have experimented with both uncompressed and compressed images and I have not been able to see any differences in the way the images are loaded or processed. Since uncompressing a lossy or lossless compressed image happens in memory, there is practically no penalty…any incurred penalties are offset by the smaller file that is faster to read. As noted by Satish Kandi above, there is indeed a performance penalty (processing time) when compressing any file. Using my muscular i7 desktop, it takes WinRAR 3 seconds to compress a full size NEF from 75mb down to 45mb. I doubt the D810 has anywhere close to the processing power of my desktop. A critical benchmark is needed to make an intelligent choice between Uncompressed (faster) and Compressed (smaller). For example, the sports photographer cannot be tied down while the camera grinds away compressing each rapid-fire image. Conversely, the landscape photographer can certainly tolerate compression processing between images. The D810 buffer is sufficient to shoot a multi-row panorama series while giving the camera sufficient time to compress each image. While your D810 does not have a desktop-grade CPU, keep in mind that a lot of the processing nowadays happens on the hardware level and manufactures like Nikon came up with ways to process those images incredibly fast, even faster than what your desktop machine can do. So there is practically no penalty for creating lossy or lossless compressed RAW images. You can test this yourself by shooting a bunch of images in lossless compressed vs uncompressed RAW with any modern camera. In fact, you might be surprised to find out that it is actually more beneficial for sports and wildlife shooters to go with a losslessly compressed RAW file, because it will keep the buffer from overflowing, allowing photographers to shoot more images continuously. Compression was a concern on some early cameras (like the Nikon D300, which slowed down on compressed RAW files), but nowadays the processing power of the modern cameras is enough to handle any type of compression. Your Intel i7 processor is entirely different from a Nikon Expeed processor. Your i7 is a general purpose CPU designed for backwards compatibility with the 8086 (and earlier) instruction set; whereas the Nikon Expeed processors consist of multi-tasking processors, and supplementary on-chip hardware, that are specifically designed for the purposes of not just digital signal processing per se, but also their camera-relevant digital signal processing algorithms. I very much doubt that your i7-based computer system is capable of performing the same tasks, with the same low level of energy consumption, and in the same elapsed computing time, as a Nikon Expeed processor. Is your “muscular i7 desktop” computer capable of processing NEF files at the rate of, say, 10 files per second while also honouring the camera settings, including: Nikon Picture Controls; noise reduction; custom two-axis white balance setting; and the user-selected resizing of the JPEG image [rhetorical question]. Pete, please drink the decaf. There is no need for a fan-boy response over a discussion. Being a computer hardware engineer, I do fully appreciate the advantage of specific-designed functions in hardware. The Atari ASIC chip comes to mind as a very early, yet very efficient design. The 6502 far outperformed the x86 architecture of the day. Compression takes more time. Not negotiable. When you profile the code, it is quite apparent. There is very likely advantage in the overall bus transfer time to store a compressed image. Writing a 50% compressed file reduces the bus data transfers by half, but the bus setup remains the same. The Expeed may be highly engineered for compression, but the D810 is still only a UHS-1 bus speed device. Real life write testing on D810 shows the very fastest cards in the 98 MB/s range. Without a controlled set of test parameters, compressed vs uncompressed remains speculation. And the subject of a good discussion, as we are having here. After reading this article, I set up some test shots using Lossless Compressed. I experienced no delays in camera, and had the pleasant experience of much faster off-loading the NEF to my desktop. Our next shoot is in 3 weeks, and I will be using the Lossless Compressed option this time out. Thanks for mentioning the Atari ASICs (CTIA and ANTIC) and its 6502 CPU. The Atari 800 was my first computer, which I managed to buy, along with 5.25-inch floppy disk drives and a non-working Atari 130XE, from someone who’d upgraded to a later model. I managed to repair the 130XE. The reason I needed my own computer was not to play games, it was to fully test an algorithm I’d created to solve a technical problem in my work. There were a few computers available in the workplace at the time, but company rules dictated that they had to be switched off when unattended. Atari BASIC enabled me to program my algorithm in machine code for its 6502, and to update the display with an annotated graph of the accumulating test results. It took nearly two weeks to complete the test. I’m writing this comment on a machine that has a dual-core i7 with hyper-threading, running at circa 1,700 times the clock speed of that 6502 CPU. When I was programming that 6502 I would not have believed anyone who said I’d eventually have a home computer which runs at clock speeds in the GHz region and has gigabytes of RAM! 6. a JPEG ‘thumbnail’ image. Thanks again for your interesting and informative reply, and I apologise for my previous comment. Whether it takes more time to generate a compressed or uncompressed RAW image in memory isn’t going to be obvious without a detailed knowledge of the system architecture. Without that detailed knowledge, it isn’t possible to say – a priori – which will be faster. Best just to try both, and see which works better. I would like bring two points here. First the raw capture doesn’t capture all three values (RGB values) at each pixel location, its just one of the component. so your number of tones like (4096x4096x4096). in fact whole paragraph (ie 12bit vs 14bit vs 16bit RAW ) is meaning less and needs to be reviewed. In Raw capture the three color channels comes in to picture only during demosacing stage in raw processing stage( in LR/ACR/Rawtherapee/darktable) which anyway takes place in 32bits/color space that too in floating point mathematics so the number tones you are talking about in that paragraph is incorrect. The number of tones comes in to picture when you export to 8bit jpg or 16 bit tiff. correct me if I am wrong. I’d love to see an article about something I’m looking into right now, since it could become very valueable in the future D850. I shoot a D5 and D500 and both have small, medium and large Raw. This seems different then in the D810 which only has sRaw. The sRaw from the d810 I found unusable, since it destroyed just all the exposure latidue we have with raw. I’m curious to see if the newer implementation of smaller raw files is finaly usable and that may be very interesting for potential D850 buyers if nikon allready managed to get that right. I mean who wants 46MP raw files every time you have to shoot a family thing, right? I’ve decided my answer is to shoot RAW + jpg on my a6300 and RX100 III. For some reason I like the a6300 jpg more than the jpg from the a6000 I had, and the RX100 III is fine too (but still a little different). I keep only the best of the best RAW files, but I keep lots of fun/silly/out-of-focus/random-but-enjoyable .jpg. For the D750 however, only NEF, all the time. But I also shoot 12-bit compressed because Verm’s article from some time ago showed me that there isn’t a whole lot of need for me to have the larger 14-bit files. Still, I intend to shoot 14-bit when I’m doing landscapes in Colorado in 6 weeks. Just in case. Andrew, please see my earlier comment 4.1 where I answer this exact question. I very much doubt that the D850 will have true pixel binning. I believe it is going to sport the same demoscaiced sRAW, making these options practically useless. So, say that Lightroom processes a Lossless Compressed RAW file, does the file size then increase when it decompresses it? So, like if I apply a preset to all incoming RAW files or create 1:1 previews, does it then decompress them and take up more space? Good question, Joshua! I just ran an experiment on my 14 bit lossless compressed files. I checked the saved file size on the XQD card, imported it into LR, edited it some and re-saved it. The file size is unchanged after processing. I would think that this is because the way LR records edits is to create a separate sidecar file (.XMP files) which contain the edit information. The original files remain untouched as LR is “non-destructive” when editing. Of course, if you change the file from .NEF to .TIF (16 bit) the file size goes from 20.9MB to 97MB!! Please keep in mind that RAW images are non-destructive, so saving a file in Lightroom will only generate a sidecar file with your edits in it – the original RAW file is never touched. Only DNG files can be changed, but that’s because the sidecar information is saved into the actual DNG file. However, if you open the image in Photoshop and work on it, once you save the image, it becomes a TIFF, which would obviously be much larger in size than the original RAW image. I understand your point, Mansurov, but it was slightly erroneously formulated. RAW-images, or the files that contain them, are not non-destructive. Lightroom might not edit them but other programs certainly do. Sure, some software might be able to overwrite date and other camera-related info / metadata, but it surely does not touch the actual RAW data, at least not to my knowledge. Joshua, no, the file size does not increase, since decompression takes place in memory. It is better to have a compressed RAW file, because it is read faster than an uncompressed RAW file. Even if there is a slight penalty for decompressing a RAW file, it is offset by the time it takes to read the file. Thank you! It all makes sense now. Nasim, Can you do a quick lay person explanation of pixel binning and demosaicing, please? I have read the definitions but need you to help me understand the concept. I read that pixel binning is compressing four pixels into one, and demosaicing is reconstructing a digital image from an incomplete color sample. I understand to a point, but need some help with how they are involved in creating RAW images in small, medium and large sizes. If you don’t mind I’ll try to answer your questions. But before going into detail, keep in mind that in basic terms in a digital sensor the photons that fall in each pixels are converted to electrons, and these are then converted to a digital value by an Analog-Digital Converter (ADC). Pixel binning (in its true sense) is taking the electrons of more than one pixel to the ADC to obtain one value. For example a 2×2 binning would take the electrons of four pixels to the ADC to produce one value, and this would reduce by 4 times the resolution of your image. The issue is that you are passing 4 times the number of electrons to conversion, or in photographic terms you would end with a exposure 2 EV higher than without binning. What I think most people ask with pixel binning is that after the ADC you average the [digital] values of four pixels, as that would keep exposure constant, but I could be wrong. Demosaicing is a form of interpolation, that is, a mathematical way of guessing values that you didn’t measure from what you did measure. In most digital sensors half of the pixels measure green light, a quarter red light and the other quarter blue, but you want to have information of all colours in all the pixels, so you interpolate from nearby pixels the values that you don’t have. The issue of this approach is that introduces artifacts to the image (like aliasing and moire), and pixel binning exacerbates this issues. Lastly, the issue with small and medium raw files is that unless you reduce the resolution by the square of an integer (by pixel binning), you need to interpolate your original data. Now, I don’t know if that could be done in a better way than what is currently used by Canon and Nikon (which as previously stated, can’t match the flexibility of true raw files), but I would believe that is in no way and easy problem to solve. Greetings and thank you for the valuable information you provide the reader with here, I might add that there is some time consumed while saving from Uncompressed to Lossless Compressed and back, so it is not totally without cost to save to “Lossless Compressed”; some load is put on the processor / processing. In a similar work flow action, smaller entry and intermediate SLR cameras tend not to have so big of a buffer area so they stop shooting after taking a certain number of frames in continues shooting mood; while shooting in RAW files only, the camera stops because of a filled buffer area, but when shooting jpg files only, the camera cease to shoot because of a busy processor turning images into jpg saved files. If there isn’t any difference between Lossless Compressed and Uncompressed image quality wise, I am curious why Nikon would even make it an option at all and just go with the Lossless by default ? There has to be a reason the option choices exist. Would love to know why. For historical reasons in order to maintain backwards compatibility with file reading software which was unable to cope with compacted data records — aka: packed records — rather than each data element being padded such that it precisely aligned with the physical address space granularity of the computer architecture for which the file reading software had been written. Neither 14-bit nor 12-bit packed records align with the physical address space granularity of 8-bits-per-machine-word CPUs. 12-bit packed records align with the physical address space of 4-bit CPUs, but 14-bit packed records do not. 14-bit packed records align only with non-existent 2-bit, 7-bit, and 14-bit CPUs. Dear Nasim, will true pixel binning reduce resolution to 1/4 of original, like with Phase One in Sensor+ mode? Have new A7RM2 and have been setting to uncompressed RAW and happy with it. I use 64G SD cards and only fill a 1/4 of them. Ok, longer transfers time to computer. In LR my computer fan cranks up and LR slows down (a lot) (Also have a New computer). If I take Bracketed shots (finding not really needed) it can be like the early days of processing, real slow, unless you copy as a DNG File. Now I have found no problems when importing to Capture One, and it remains very fast, but there is no way to process bracketed photos to merge into a HDR file but you can export to PS now but again even PS slows down. My question is how will Aurora handle the file size(s)? I still take bracketed shots just because you can not recapture something and like the days of film it is something that is a habit. My point here is the recovery of shadows and highlights in just one image with the uncompressed image can be and most times is as good as a doing it HDR. And the ability to shoot a night shot at ISO 100 or 200 instead of 3200 or 6400 so as not have blown out highlights and just increasing exposure is awesome! The Dynamic Range of the sensors in the A7RM2 and A7S if a shot is done normally is impressive IF you know what can be done in Post. Not to blow some dust about Sony, I still use my Canon T2i and with advancement in LR/PS and Capture One processing images are coming out more awesome every time. I am not a Pro PP but those who are maybe the only ones to answer the compressed vs uncompressed selection problem, they have the beast of computers and monitors AND EYE!!!! Perhaps you’ve covered this, but what exactly is a raw file? Some say it is the non-image data that is siphoned off the sensor, which is then converted to an image format in a post processing application. But according to Wikipedia, what is referred to a raw file is actually a tiff, meaning when it is sent to Lightroom (for example,) the raw file is actually an image, albeit one with brand proprietary tweaks. It’s those tweaks that require the specialized post-processing. Wrong, right? A RAW file is a stream of ones and zeros that can only be converted into a visible image using software that can decode it. Hi Nasım. As far as I know, only Canon 1000D uses 12bit RAW files and all other Canon DSLRs use 14bit RAWs. Pardon me but shouldn’t the math be 4096 x 3 , meaning per channel ( red, green & blue) ? Not times itself three times. Similarly, 4096 levels per channel is 12 bits per channel: 12 bits × 3 = 36 bits per R,G,B triplet/pixel, which has 2^36 ≈ 68.72 billion possible levels. 2^36 is exactly equal to 4096^3. However, cameras that use a Beyer filter mosaic do not have pixels per se, they have sensels arranged in a grid pattern, typically RGGB or RGBG. It is the computed values (adjusted for ISO and various other factors) from each of these sensels that are written to the raw data container section of the camera’s output file (colloquially know as a camera RAW file). So, if we had such a camera which claimed to have, say, exactly 36 million pixels, it would actually have only 9 million red channel sensels, 18 million green channel sensels, and 9 million blue channel sensels. It would not have the 36 million red, 36 million green, plus 36 million blue channel sensels it would require in order to actually possess 36 million tricolour pixels. The post-processing software will indeed generate 36 million tricolour pixels from the camera data by using a compatible Bayer filter demosaic algorithm which interpolates to estimate the values of missing data samples. From the above paragraph it is obvious that a Bayer filter mosaic camera, claiming to possess N ‘megapixels’, actually has only one sensel per claimed ‘pixel’, not the red, the green, and the blue sensels required to generate each of the N tricolour megapixels in its rendered output image. Therefore, 12-bit RAW contributes, on average, only 12 bits per pixel (4096 colours), not 36 bits per pixel (~68.72 billion colours), to each tricolour pixel in the rendered output image of N megapixels. If we pixel peep the rendered image, we will be able to clearly see the effects of these small intra- and inter-pixel colour gamuts, which is one of the reasons why pixel peeping is either pointless or a time-consuming obsession. Now, if we downsample the final image using a linear scale factor of 1/2, an area scale factor of 1/4 (e.g., 36 megapixels down to 8 megapixels), then each pixel has a reasonable chance of being composed of 12 bits of red channel sensel data, circa 13 bits of green channel sensel data, and 12 bits of blue channel sensel data. Each resulting pixel has a reasonable chance of having a colour gamut size of tens of billions of colours — exceeding the capability of: most, if not all, LCD monitors; colour printers; and human colour vision. Endnote: As usual with science- and evidence-based technical topics, that which I’ve presented above is an overly-simplified version of the truth for the sake of brevity. For instance, I have not gone into the important details of the semi-logarithmic nature of human vision, and how this factor can, and often does, impact the decision to choose either the 12-bit or the 14-bit ‘RAW’ option (when available). Nasim has, I think, succinctly summarized this issue in his excellent article. 4096 x 4096 x 4096 is correct. If you just consider red and green channels, you can see that for each value between 1 and 4096 that the red channel may have, there are 4096 values the green channel may have. So with two channels the total number of combinations is 4096 x 4096. Add in a third channel for blue and for each of the 4096 x 4096 red/green combinations there 4096 values that the blue channel may have. This gives a total of 4096 x 4096 x 4096 combinations for three channels. Nasim, you didn’t mention DNG Raw files. Being a Pentax shooter, and since Pentax is one of the only cameras that has in camera DNG RAW file capability, I always shoot DNG. What does this do for me other than the biggy–just one file- no sidecar file! If I remember correctly, when K5 came out Pentax representative said something like “now Pentax perfected DNG output and there is no penalty in shooting DNG” – that probably means there was some penalty in earlier cameras. The big mystery, why is uncompressed even offered as an option? The only reason I can think of is that certain superstitious types refuse to believe that compression can be lossless. The sample picture shows ringing noise. Which is not true for Sony lossy RAWS. As found by the original dpreview article, the problem with Sony lossy RAWS is when you push the highlights too many stops and a halo can be seen on high contrast edges. The example picture looks like ringing noise from jpeg compression. Well the halo’s can be seen 16 pixels around the highlight and is usually very much like ringing noise. If you want to see some real compression artifacts you need look no further than the DPreview studio comparison tool. Choose the Nex 6 ISO 100 Raw (low res so easier to see) and open in your processor of choice. Now you should be able to see artifacts around the highlights on the metal part of the brushes pushing the shadows less than a stop. If you really want to see something really bad push the image 3 stops (apparently DPreview thinks we do this with many of our images as their numerous articles on dynamic range attest to) and look at the neck of the bottles near the light reflections for some horrid comprerssion artifacts. That DR range isn’t so useful if it uncovers that .I first noticed Sonys Raw compression noise when doing city scapes at night and it can be seen without any pushing at all as long as you have any vertical clipping, which is inevitable with city lights. It had earlier been popping up on product shots as this unusal noise (easy to correct like dust but still a pain) but once I saw the DPreview article the penny dropped. Still use Sony for 95% of my shots because it really is a non issue most of the time but people need to be aware there are cases where this does occur. Since Nikon’s lossy compression applies individually to each pixel, it cannot cause the kinds of spatial artefacts that you see in Sony’s lossy files, or in JPEGs. Agreed you won’t see the 16 pixels of noise as you can on Sony shots and overall the Nikon compression is fine/undetectable for 99.99% of normal photography. It does however have a habit of eating stars. Also for any shot where you may be planning to average out 10 or more shots the compression could be an issue but again this is fringe case use. IMO, it’s fatal extrapolation here. The 12/14/16 bit refers to the digitization steps of the signal data from sensor’s pixel, NOT picture’s pixel. So the million/billion/bloation color fidelity per picture pixel is nothing but hallucination. Lensman Arisia, See comment 19.1, which is based in science, rather than opinion. I can see one benefit with the uncompressed RAW option: in case of corrupted file, it can maybe give better chance to recover the original photo. Is it right? Did you forget about Pentax or was avoided on purpose? DNG or PEF, which is better? Hi guys, did anybody notice if the lossless compressed RAW on a Fuji XT-2 is actually draining the battery much faster than with uncompressed RAW? I’ve been using 2 Fuji XT-2 for 1 year now, but i only started using the losses compressed RAW some 3 months ago. Funny how, just in the same period i started noticing that the batteries life has become much shorter: 3 batteries (1 in the body plus 2 inside the vertical grip-booster) used to last kinda the whole working day, while now i’m lucky if they last 2/3 hours or so. For a complete information, i shoot LOSSLESS COMPRESSED RAW +MEDIUM SIZE/NORMAL QUALITY JPG, in order to have a proper JPG preview to work on while reviewing a shooting, since the embedded JPG preview of Fuji is too much too small. 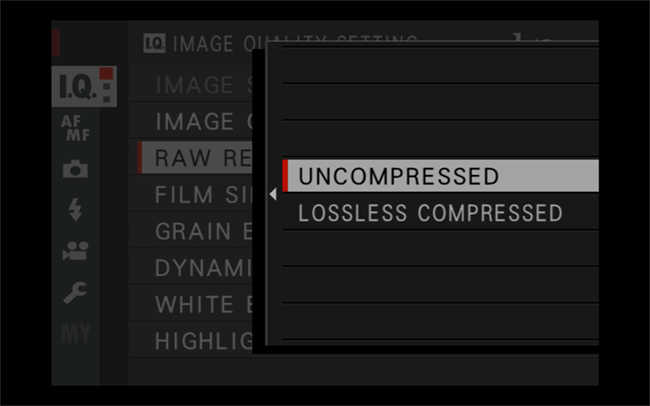 If the compressed raw format is OK, why is the uncompressed raw option still present? Read answer No. 27. CPU eats power… relieving it from work delivers more battery power.